Asparagus is a food jam packed with super nutrients including vitamins A, b-12, C, E and K along with minerals zinc, manganese and selenium. It is also a natural diuretic that helps your body flush out excess fluids and is jam-packed with antioxidants which help slow down the aging process. Oh and did we mention that a serving of asparagus is only 25 calories and is a natural aphrodisiac, talk about super foods. With that in mind, enjoy four fabulous asparagus filled recipes! In a medium bowl, whisk together the egg substitute, egg whites, and milk. Stir in the scallions, thyme, parsley, pepper, and salt. Place the asparagus and water in a large microwaveable bowl. Cover with vented plastic wrap and microwave on high power for 4 minutes, or until crisp-tender. Stop and stir after 2 minutes. Drain, pat dry, and add to the egg mixture. Heat a medium nonstick skillet coated with cooking spray over medium heat. Pour one-quarter of the egg mixture into the skillet, allowing it to cover the bottom of the pan. Cook for 2-3 minutes, or until the bottom just begins to set. Sprinkle with 1 Tbsp of the cheese. Add one-quarter of the asparagus pieces. Cook for 5 minutes, or until the eggs are almost set. Using a large spatula, fold the omelet in half. Cook for 3 minutes, or until the omelet is golden and the cheese is melted. Coat the skillet with cooking spray and repeat the process with the remaining ingredients to make 3 more omelets. Bring a medium pot of water to boil. Add asparagus and boil for 3 minutes. Drain and rinse under cold water immediately. Dry thoroughly. Mix all other ingredients together. 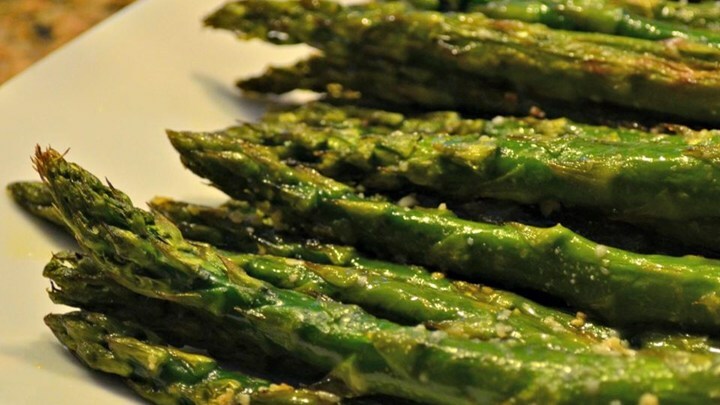 Toss asparagus with balsamic mixture. Place the steak in the freezer for 45 minutes to make it easier to slice. Meanwhile, make the marinade. Place the coconut oil, pineapple juice, sesame oil, garlic, fish sauce, ginger, and red pepper flakes in bowl. Mix well, and set aside. Remove the steak from the freezer, then cut across the grain into very thin strips, about 1/8-inch thick. Place the steak in a dish, pour the marinade over it, and refrigerate for up to 2 hours. Preheat a grill to medium-high heat. Rub the olive oil over the asparagus and wrap each stalk with a strip of beef. Sprinkle with salt, pepper, and sesame seeds. Grill the beef-wrapped asparagus for about 6 minutes, turning occasionally to ensure even cooking. Cook asparagus and oil in a skillet over medium heat for 3-4 minutes. When 1 minute remains, add garlic. Set asparagus and garlic aside. Season chicken with salt and pepper. Increase heat to high and cook chicken until browned. Set chicken aside and add soy sauce and chicken broth to skillet. Bring to boil for about 1 minute. Add lemon juice, water, and corn starch and stir for about 1 minute. Return chicken and asparagus to pan. Coat with sauce. Top with lemon zest and Rosemary.